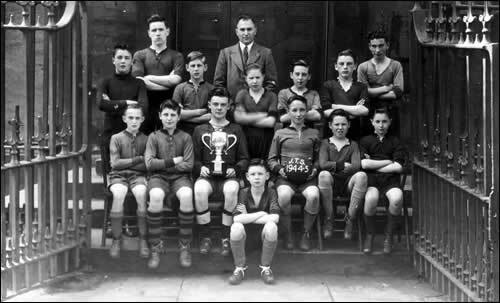 The Junior Technical School Football Team in 1945, displaying a trophy by the proud players. If you owned your own pair of football boots in those days, you were well off, though not all are wearing shin pads and those boots look awfully hard. I attended J.T.S from 1940 to 1943. The teacher in the football group, I'm almost sure was Mr. Stewart. All very interesting. Regards to anyone who remembers me.